Looking to enhance productivity and efficiency across your people-centered services organization? A Professional Services Automation (PSA) solution can have an enormous impact. This eGuide is a must read for PSO professionals weighing up its benefits. 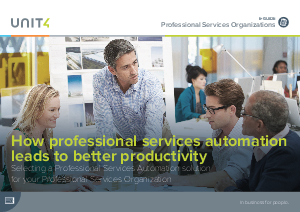 Download it to discover why and how professional services firms are implementing PSA, to learn the major difference those PSA tools are making, and to get a checklist for selecting the right PSA solution for your business.